This tag cloud was generated by http://www.wordle.net/. Figures from the DfES show the average numbers of IWB installed in schools during this key period. There is a significant annual increase in the number installed in UK schools during 2002 – 2005. However, there is a considerable variation in figures for individual schools. Not all classrooms were equipped with IWB; not all teachers had access for all teaching. IWB research published up to, and including, 2006 should be interpreted in terms of this material base. The focus of early research was the impact of the technology on individual teachers and classes: a MirandaNet study in a UK comprehensive school (Smith, 1999); on foreign language classrooms (Gerard, 1999). Another early focus was the potential of IWB for Mathematics Education, and as a platform for students’ work (Grieffenhagen, 2000). Some subsequent studies looked at implementation issues: 6 primary schools in Kent (Smith, 2001); one secondary school. A user typology was developed and later refined (Glover & Miller, 2001). Other studies looked at user perceptions. In a US High School, of 609 students; 92% said that IWB helped learning (STCC, 2002). In a Sheffield University study of a comprehensive school, classroom observation; teacher interviews; student questionnaires and focus groups were uniformly positive about IWB use (Levy, 2002). Pupil perceptions were further explored in later studies that explored a wide range of school ICT applications with a small KS1 & 2 pupil sample. (Goodison, 2002), followed by in-depth studies during 2003 – 2004. The ongoing Keele University studies (Miller et al, 2003) extended the range to lesson observation in 12 schools. The capability of teachers was seen as important (with training raised as an issue). 6 teachers were observed and filmed, and following interviews with other teachers the study questioned the validity of traditional lesson templates. A MirandaNet survey (Cuthell, 2003) of 90 respondents showed a high level of enthusiasm for the technology. 28% were Primary teachers. 58% of whose schools had 11-15 IWB installed. 50% were Secondary teachers, whose schools had 20+ IWB installed. Teachers were enthusiastic and felt empowered by enhanced creativity. Since these were self-selected respondents, this was to be expected. A 9-month MirandaNet Action Research project with 8 teachers from 6 schools (3 Primary, 3 Secondary) showed that pedagogy and practice were changed by in-depth engagement with both the technology and other colleagues in action enquiry. As the material base grew, so the In-depth studies shifted focus. Leadership challenges posed by IWB introduction were examined by Glover, Miller et al, (2004). A typology of users was developed: Missioners, Tentatives & Luddites, and inadequate training identified as the key issue for schools. A later analysis of ITT programmes also identified issues with IWB training in ITT, with a lack of preparation for school placements. A lurther analysis of maths teaching showed that support was needed for teachers to realise the potential of both the boards and their own pedagogy. From 2005 onwards, as the boards were considered to be bedding into school, attention swung to pedagogy. The ITT community looked at pedagogical change (Beauchamp & Parkinson, 2005); the Keele team increased their scrutiny of maths lessons (Averis, Glover et al, 2005) and Newcastle University investigated the impact of IWB on Maths teaching in Y5 & Y6 (Wall, Higgins & Smith, 2005). At the same time a Christ Church Canterbury report (Stein, 2005) emphasised the role of training and support for successful implementation and use of boards in a range of phases and curriculum contexts. The impact on teaching, learning and attainment was examined (Cuthell, 2005a) through teacher and pupil feedback in a nine-month in-depth MirandaNet research project, through case studies and questionnaires. All teachers in the project saw IWB as transforming their teaching. Pupils were enthusiastic, more motivated, with improved discipline and attendance. Shifts in teacher self-belief and classroom realities were explored in a further MirandaNet study (Cuthell, 2005b), in which an ethnographic research approach enabled teachers to articulate beliefs about learning theory, and the ways in which these are integrated into praxis and pedagogy, and can be accommodated by IWB – which then support the teachers in whatever ways they approach the classroom learning process. Once the initial period of familiarization is complete (about three months or so) the possibilities of the technology and the software prove increasingly effective. The initial understanding of interactivity, that pupils would move to the board during the lesson, engage with it and then move back to their desk – and be replaced by another pupil – changed during this study. Intereractivity relates to the process of learning on the part of the pupil, a series of interactions that engage the learners and facilitate the cognitive development appropriate to each individual. IWB provide a powerful tool that facilitates the learning of the whole class, rather than some individuals. When learners are able to see, and recall, the meaning they can incorporate it within their cognitive schemas and construct their own picture of knowledge and understanding. During 2006 the impact of IWB on Mathematics were explored in depth in a number of studies by the Keele team: Gesture & the IWB (Miller & Glover) ITT & IWB Pedagogy (Miller et al); Maths teaching & IWB (Miller). One consistent theme was that there was insufficient CPD, and its focus was on content, rather than process. The KS2 National Strategy Interactions (Smith & Higgins) reported on the need for more pedagogical development. International insights (Cuthell, 2006; 2007) were drawn from further MirandaNet studies, which saw a positive impact on classroom organisation, with shifts in pedagogy to more active teaching and learning. Action research and teacher collaboration were key to successful CPD. A metastudy by Cisco (2006), ‘Technology in ‘Schools, concluded that the use of IWB results in: increased visualisation; increased interactivity; increased reflective dialogue and enhanced learning. The most recent Keele report (Miller & Glover) stresses the need for enhanced CPD, for technological flexibility, pedagogical flexibility and appropriate materials design. The IoE Study (Moss et al) also identified the need for CPD to support individual teachers’ exploration of current pedagogy, but also stressed the need for development of visual and multimodal dynamic representations, together with the role of teachers in resource creation. However, in this study the boards were installed 2003-4; research undertaken 2004-5 and the report published in January 2007. Findings from international MirandaNet studies identify classroom transformations (Cuthell) in China, Mexico, South Africa and the United Kingdom. This action research project, supported by an online community of practice, with a focus on the exploration of ways in which IWB can effect change, saw teachers develop constructivist pedagogical approaches. They worked collaboratively with colleagues and pupils. Pupils used technology to present to other pupils and the roles of all school stakeholders changed. Some work has been done on the ways in which IWB technology is incorporated within an institution. Burden (2002) developed a process typology of Infusion (learning how to use the technology, with a limited number of staff involved), through Integration (using the technology as a reinforcement of teaching, with a greater number of staff), to Transformation, where changes were observed in teaching. Glover & Miller (2002-on) identified individuals as Missioners (leading-edge teachers who incorporate technology into praxis), Tentatives (who wait to see how Missioners integrate IWB into their teaching) and Luddites (who resist technology in all its forms as ‘something else to go wrong’). 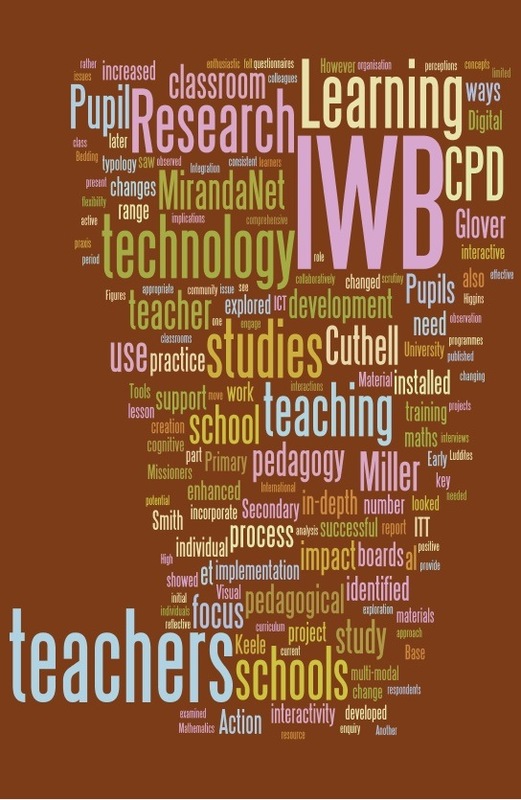 Stages of implementation identified in MirandaNet projects are iterative (Cuthell, 2006; 2007), in which the first stage sees the IWB as adding to existing practice: IWB technology enhances what we already do; we do the same things, but in different ways; the technology provides additional strategies. The second stage is that of changing the process, in which classroom activity and organisation changes, innovative materials are created and teachers find that use of the boards helps build new concepts, supporting reflective practice. Working collaboratively develops from this: teacher – teacher; pupil – pupil; teacher – pupil. The pedagogical changes involve active learning for the whole class, with support for group activities and autonomous pupil work. Pupils present work to others and the ecology of the classroom changes. The development and enhancement of interactive multi-modal pedagogies. Successful CPD engages higher-order thinking. Successful CPD is also a process of self-actualisation (Maslow). This is supported by a strong internal locus of control (Rotter). In many cases, however, there is an intrinsic struggle between these qualities, and a content-driven curriculum with prescribed outcomes and externally imposed schemes and practice. ICT CPD based on work-based action enquiry can be a catalyst for change. CPD programmes should focus on Visual Learning. They should be inclusive, and incorporate a full range of digital tools. Multi-modal resource creation should be an integral part of such a programme. Evidence-based research projects provide the most effective form of CPD. Levy, P., 2002. Interactive Whiteboards in learning and teaching in two Sheffield schools: a developmental study. Sheffield: Department of Information Studies, University of Sheffield. Maslow, A. H. (1970). Motivation and Personality, 2nd. edition. New York, Harper and Row. Rotter, J. B. (1966). Generalised expectancies of internal versus external control of reinforcements. New Jersey, Lawrence Erlbaum Associates. Smith, A. (1999) Interactive whiteboard evaluation. MirandaNet. Downloaded from: http://www.mirandanet.ac.uk/pubs/smartboard.htm (Accessed 05.06.07). Smith, H., 2001. SmartBoard evaluation: final report. Kent NGfL. Downloaded from: http://www.kented.org.uk/ngfl/ict/IWB/whiteboards/report.html (Accessed 05.06.07). Smith, H.J., Higgins, S., Wall, K., and Miller, J. (2005) Interactive whiteboards: boon or bandwagon? A critical review of the literature, Journal of Computer Assisted Learning, 21(2),pp.91- 101. Somekh, B et al (2005) Interim Report to the Department for Education and Skills. Unpublished report from the SWEEP project. SOUTH TEXAS COMMUNITY COLLEGE (STCC), 2002. Student perceptions of the use and educational value of technology at the STCC Starr County Campus. Donwloaded from: http://eric.ed.gov:80/ERICWebPortal/custom/portlets/recordDetails/detailmini.jsp?_nfpb=true&_&ERICExtSearch_SearchValue_0=ED463028&ERICExtSearch_SearchType_0=eric_accno&accno=ED463028 (Accessed 05.06.07).